the personal experience, the complications and results of the surgeon for this intervention. Video registration is an indication that the surgeon feels confident. The literature is difficult to interpret by non specialists. Endometriosis is a typical example : more than 20.000 articles have been published but most are clinically irrelevant. What is worse is that hypotheses and speculation often create false expectations. In addition the information is difficult to interpret by zooming in on details without the larger picture (something that is normal in the peer-reviewed literature since the reader is supposed to be able to interpret the data ). Websites and the lay press have not been peer-reviewed. Important is the credibility of who is giving information : this can best be judged by his background and his publications on the topic. Those who do not do surgery could give a biased information on surgery. Controversies should be explained Even well performed Randomized Controlled Trials can be interpreted differently. HRT is a typical example. It is useful to understand the background of the controversy and to know what the position is of a doctor. Which information has to be given ? who gave the consent to do a specific intervention e.g. the parents for minors. eventual additional consent : e.g. to store data of the patient in a database for later scientific use, to store blood, fluid or tissue samples for later research use. The consent you give should be clear and unequivocal. Below are some guidelines of information the patient should have before signing informed consent for endometriosis surgery. What is the personal percipience of the surgeon To judge this ask the number of cases operated per year and the total number already operated. More specifically ask how many deep endometriosis lesions of more than 2 cm in diameter have been treated. We did operate some 400 women with endometriosis/ year and operated more than 4000 deep endometriosis. Which type of surgery will be performed This should be explained in detail and best written unequivocally in the informed consent. The reason why this is important, is the discrepancy between the the best available treatment and the treatment which is used by the median surgeon in a country or region at a given moment. 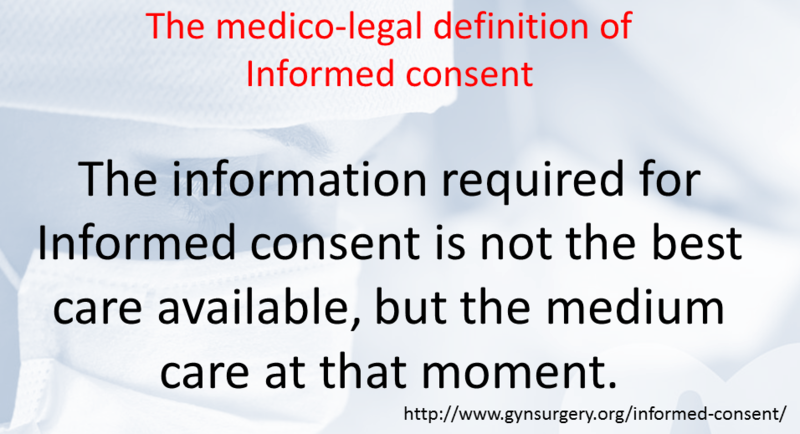 The latter is what is defined medico-legally as a normal treatment, unless defined otherwise in the informed consent. Specifically for endometriosis I consider it important that the surgeon will excise cystic ovarian endometriosis of less than 5 cm diameter (Coagulation/vaporisation only is associated with a higher recurrence rate and is often is a symptom of less experience), that large cystic ovarian endometriosis of more than 6-7 cm will be treated as a two step procedure unless in women over 40 years with only pain symptoms where removal of the ovary can be considered since easier. It should be clear how deep endometriosis be handled. If the surgeon is not experienced to excise deep endometriosis, it fair that an unexpected deep endometriosis will not be treated and that the patient is referred to somebody with experience. for cystic ovarian endometriosis : until today I never removed an ovary and since 1995 I never performed a laparotomy for cystic ovarian endometriosis unless agreed clearly before surgery. For deep recto-vaginal endometriosis : since 1995 and until today all patients even with large nodules up to 6 cm in diameter have been treated without one laparotomy ; for larger deep sigmoid endometriosis it sometimes is preferable to do a sigmoid resection anastomosis -in our experience some 10 %-. Is the surgeon prepared to tape the whole procedure and give you a copy of the surgery. This probably will be charged extra because of the work involved. It anyway give a good estimate of the confidence of the surgeon, his surgical skills and experience. An often heard criticism is that this will show any mistakes or errors and that this is actually unacceptable in the medico-legal climate we are living in. I believe that the best relationship is an open one, where the patients knows what the experience of the surgeon is, knowing that nobody is perfect and that any surgeon will make occasionally a mistake -errare humanum est. What is the problem of information ? Complete, precise and detailed information requires a medical back-ground to fully understand subtle differences. Information should therefore be given in an understandable language. The medical language was developed to facilitate exact communication, between doctors. Without the medical language information tend to become imprecise. Not all information is wise to give. The problem is to understand how certain the diagnosis is ? and what the margin of error is. Medico-legally a “correct diagnosis” is the diagnosis that at that moment would have been made by the medium gynecologist - not by an expert. 3. Which surgery is planned and what are the risks ? The standard of care for a given country at a certain point in time is not necessarily the best care available at that moment. The prevailing medico-legal standard to judge an intervention is ‘the median standard of care in that country at a given moment’ . This is translated by professional bodies into ‘Guidelines’. It is accepted that all risks with an incidence higher than 1% should be mentioned. 4. What are the alternative options ? 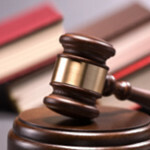 Medico-legally the standard of care is the median standard of care in a country at a given moment’ and information should thus be given on all alternative “median standards of care” . This median standard of care is not necessarily the best care available (e.g. hysterectomy by open surgery or laparoscopically). It is unclear when new alternatives become mainstream knowledge. An example : Today the numerous advantages of a laparoscopic hysterectomy are well established but the prevalence of laparoscopic hysterectomy still is only 10% to 30%. Information thus will vary with the level of (sub)-specialisation of the surgeon, and between opinion leaders and general practitioners. Our principle is to give information on all alternative treatments currently discussed at international meetings, including those we do not perform ourselves. 5. What can be decided during surgery ? it is not clearly defined what ‘unexpected’ findings and emergency situations are. when the intervention is outside the comfort zone of the surgeon eg deep endometriosis or cancer. Half an intervention immediately or a referral later eg an hysterectomy while leaving the deep endometriosis . 6. What are the results and complications of this surgeon for this intervention ? either reported by centres of excellent surgery devoted to a specific pathology which have more expertise but also treat more severe pathology..
or complication reviews of countries with incidences which are higher, highlighting the difference between the standard of care and the best care available. 6. video-registration of the entire intervention ? What is necessary surgery and are complications a re e.g. a ureter lesion for deep endometriosis excision in association with an hydronefrosis often is necessary to be complete. We reported 18% lesions. The same holds true for the 5-1% late bowel perforations after deep endometriosis excisions. For this reason video-registration is standard for our group. In addition we try to publish our complications in an effort to discuss prevention, and in order to help others.